I filed a lawsuit to stop an illegal meeting of an illegal committee to tour school buildings to close. I was ready on Feb 7 in court to hear and try the case. It’s not that complicated, and the most the law states I’m entitled to is $500 measly dollars. The filing fee was $330.50. Go figure. The case is all related to the Ohio Open Meetings Act- or Sunshine laws. They specify clearly what can and can’t be discussed in public and in private by elected officials or committees. This is an easy case, since I have video of all the violations and meetings. The city and school board sent 4 lawyers to court. It was David v Goliath. I’ve posted about this before. We were supposed to have a phone conference today at 10 am with the judge to set a hearing date. Instead, we got his staff attorney. 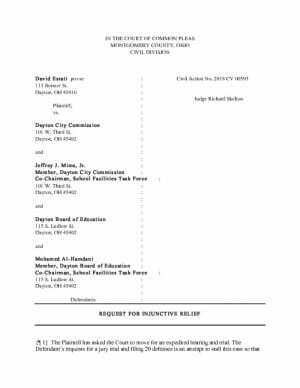 The School Board yesterday filed a request to have a jury. Today, the city filed a 7 page response to my initial complaint with 20 defenses. The staff attorney questioned the jury demand- since this isn’t really a case where facts are disputed- just the application of law. He’d not seen the city’s 20 defenses yet. They are laughable. Both sides of the defense are engaged in tactics to stall and add cost (and billings for the School’s private attorney who probably bills at $300 hour or more). 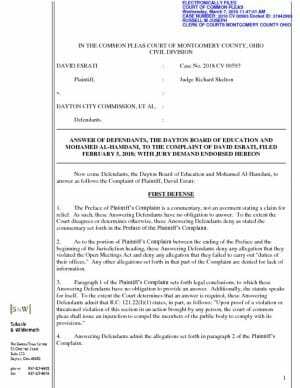 They claim there is no reason to move quickly on this- despite my claims that the outcome of this case reflects on the competency of the acting superintendent, and could have an impact on the makeup of the school board if the Ohio Attorney General’s Open Government Unit decides to remove members from office for violating the law- once the judge decides they did. 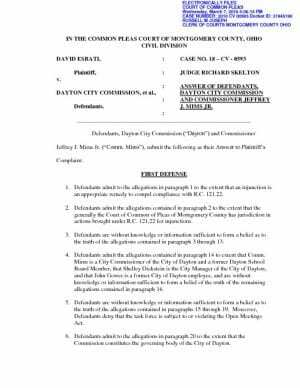 Since the board has stated that they will move quickly on the closings, and the courts seem to be moving slowly, I filed an injunction asking the judge to stop all discussion of closing schools until this case is settled. 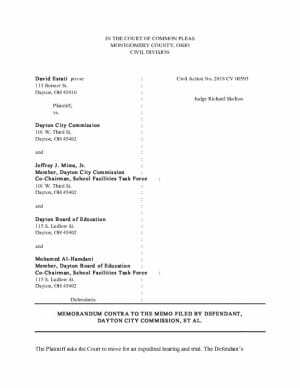 I’ve attached my last memo contra, the school boards filing, the city’s filing and then my final request for an injunction for you to read. I enjoy how you poke the lawyers but you know that will come back to bite you. Not impressed with Wildermuth or the other idiot lawyers that I keep seeing at the taxpayer expense. Instead of dragging this out they should be looking for resolution but then again they wont be able to continue to milk the proverbial cow of unlimited taxpayer legal fees. I like Judge Skelton, I think he is pretty fair. Amazing that Wildermuth is housed in the Greene and not even in the city of Dayton. Guess no competent lawyers to handle school board business inside city business?